Low buck performance parts are always fun. If you have an American car such as a Foxbody Mustang, a few hundred bucks will get you an intake, a set of headers, or maybe a short shift kit. On an old German car, the exchange rate of horsepower per dollar isn’t in our favor, but that doesn’t mean there aren’t cheap and cheery upgrades to do. 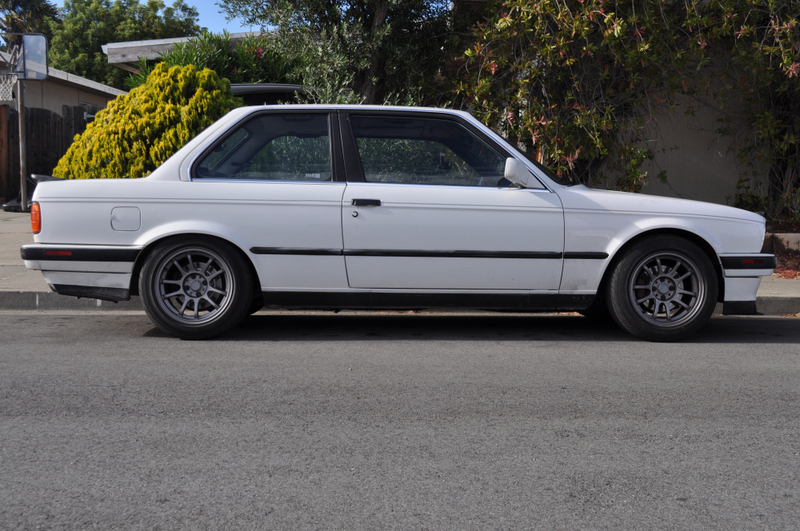 Here we’ll discuss how a set of H&R Race springs helped to improve the overall fun factor of our 1988 BMW 325is e30. 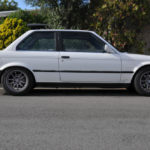 If you recall the article about the Fish Factory Special e30, there was mention that the car was purchased with Bilstein Sport Shocks & H&R OE Sport springs previously installed. 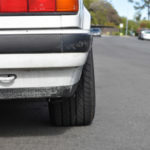 For people such as myself who can’t handle the Stance Works coined term of “low” for a daily driver, the OE Sports were more than enough drop at 1 inch front and rear. Dirty Dan on the other hand felt that the car needed a more aggressive drop and higher spring rates to make for a better driving experience. Here’s the box of the springs…because we forgot to take pictures of the actual springs. Think the tires will last with that camber? 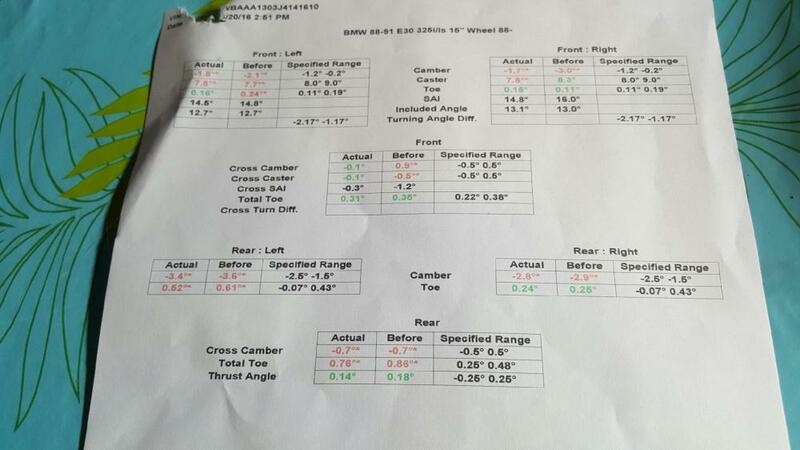 Here’s the alignment specs. We’re more interested in the table cloth pattern! Initially we had thought a set of Ground Control coilovers would be a good choice, but two consecutive Grover Cleveland bills (unlike his presidential terms) was a bit much for a car that only needed a mild upgrade in spring rate. 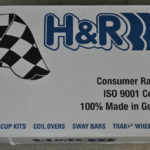 A quick look on Tire Rack showed that H&R Race springs for the e30 chassis could be delivered to the front door for $319. Two days later, a box showed up with some red beehive looking pieces of metal. If all else failed, we had the key components for a new line of adult sized Moon Shoes. Many of the off-the-shelf lowering springs are progressive in nature. What that means is the springs have a bit of squat, or a softer initial rate, before they settle into their final spring rate. The idea being that street driving with poor quality roads won’t make for a bone jarring ride. 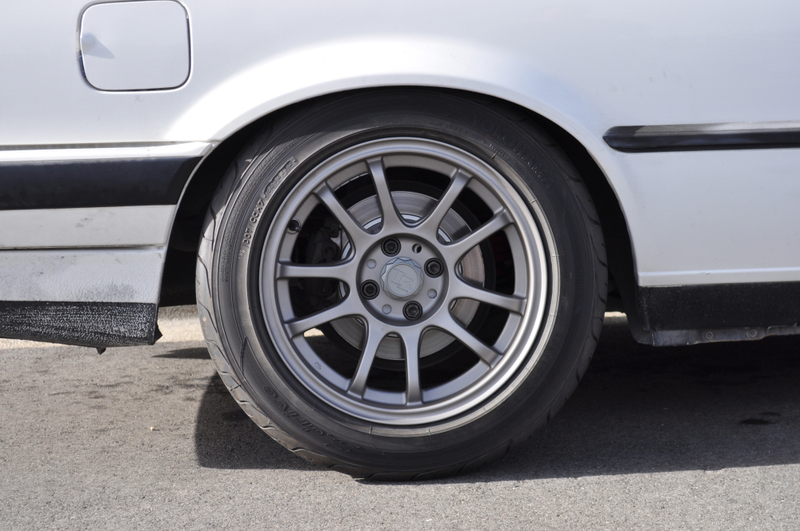 For sake of comparison, the OE Sport springs of the e30 are rated up front at 180 lb/inch, 380 lb/inch for the rear of the car. 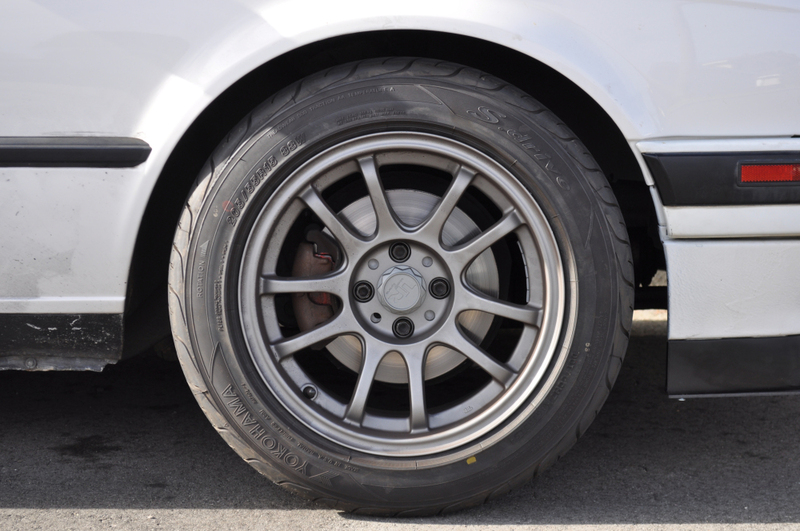 The new H&R Race springs are rated at 315 lb/inch & 570 lb/inch for the front and rear respectively. 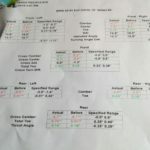 While this may seem like a radical jump in spring rate, it should be noted that the new rates won’t be felt until the suspension is fully loaded. After a Saturday spent installing the springs, Daniel got the car aligned to make sure the new tires didn’t get chewed up instantaneously. I finally got a chance to see and drive the car a few days later once aligned. As advertised, the ride height is about a half inch lower than before. The springs may still need to settle, so the final ride height could be subject to change. Driving the car was a pleasant surprise. Around town the car felt marginally stiffer, perhaps making expansion joints a bit more noticeable. Once we got to some curvy bits of road though, the car really came into its own. The new springs made the suspension much more responsive. The handling was more confidence inspiring. Cloverleaf freeway ramps could be taken with little fuss before merging into traffic. It should be noted that the car has always had a set of Spec E30 style sway bars installed since Dan got the car. With the OE Sport springs, the sway bars had to pick up the slack due to the lack of spring rate. The new springs seem to work in conjunction with the sway bars, making for a more balanced package. Are they the end all be all? No, but for a beginner setup they are more than up to the task of spirited driving. Dan thinks the front end could stand to go a bit lower. I agree with him from a visual perspective, but lowering the car another 12mm with a set of drop hats is going to do two things: 1) reduce the already short suspension travel and 2) put the notoriously low front sump oil pan 12mm closer to sudden impact. The pan can be protected with a skid plate we have sitting in a box, but that’s a project for another day. The other thing to take note of is that the H&R Race springs have made for some interesting alignment specs out back. 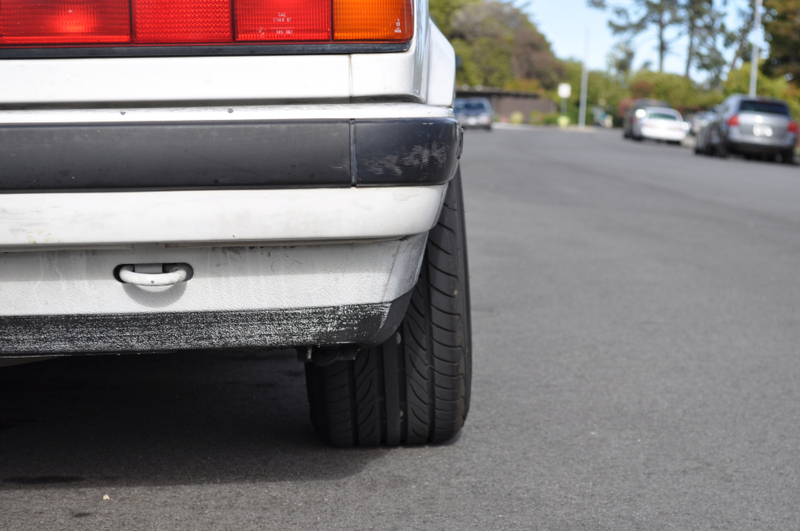 The rear camber is somewhere in the neighborhood of 3 degrees, and most definitely toed out due to the lack of adjustability. To fix this requires welding for use of eccentric bolts and/or raising the rear subframe with purpose built bushings. Any way you slice it, the rear end has to be modified or the ride height raised if you don’t want to chew through tires like a set of sneakers. 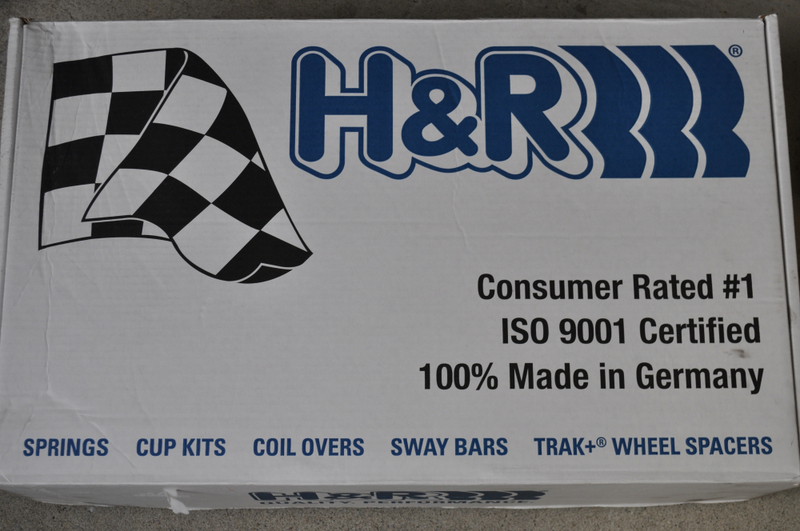 For $319 shipped, the H&R Race springs made a nice improvement to the car’s handling without going overboard. This car serves as a daily driver, so it still needs to be able to drive on torn up Bay Area roads. If it were a dedicated track car, then I can see where a linear spring rate setup would prove more capable. For the time being, neither of us are skilled enough to push the car ten tenths, especially not on a public road. For that it’ll be a trip back to school.